We know we can use a software to protect a document with a password, like LockNote, but do you know how to protect a photo with a password? Of course, maybe that should be easy, just use Zip or Winrar with a password. Actually, we have another way, use a tiny software to lock your single photo with a password. 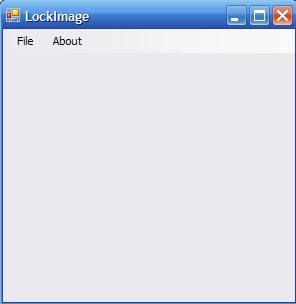 Lockimage is a tiny software only 32kb, but it can helps you lock your single photo. It is very simple to use, download it here, uncompressed, you can put it anywhere in computer's hard driver, even with a USB flash driver. Run the file that will appearing a small window with a very simple interface, click File > Open, browse an image that you want locked. It will open that photo, you can click File > Save as. Give it name, save as an .exe format file. A tiny window appear with password form, just give a password to lock your photo, then save it. All done, check your file that will be an .exe format file, not a image format file. If you want open it, just click that file, it appears two windows, fill password into form, it will open that photo.